Foto Friday CXII – ..:: NJ Brideau ::.. This is another picture from Portugal, in a city called Sintra that is very near to Lisbon. Sintra is home to the Portuguese royal palace, but also a structure called Castelo dos Mouros that dates back to the 9th century. The Moorish castle is on the top of a hill and offers some amazing views of the surrounding area. 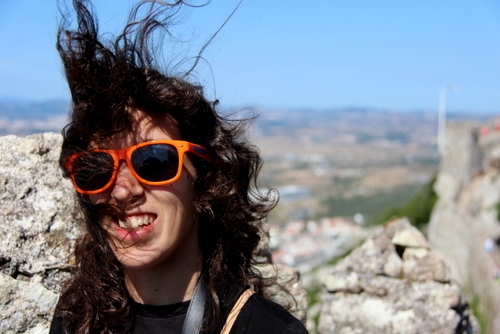 A byproduct of the elevation is that the wind is very strong, nicely illustrated above by Mafalda’s hair. 1/1000s f/4.5 40mm ISO 100. No adjustments. Au revoir until next week.